The hammers, trucks and cranes indicate construction is swift on Main Street and 2nd Avenue North. And when Joe Faw, the co-owner of Bay to Bay Properties, LLC provides us his most recent status update he states assuredly, “the dust will settle,” this upcoming summer on the commercial project. The site is soon to be the home to three stories of vibrant commercial action and a luxury apartment building in downtown Safety Harbor. Bay to Bay Properties will be establishing their more permanent and spacious office location in the top two stories of the building facing Main Street, moving from their current location on 2nd Street South. Also, set to open in the summer will be two restaurants on the first floor level, and an additional juice bar and eatery on the second floor. Each dining concept varies from the next, and will provide Safety Harbor residents with never before seen options. 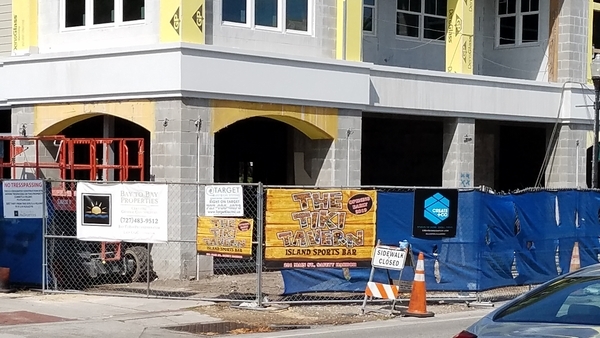 The Tiki Tavern’s sign has been posted since the early stages of construction and they frequently post exciting messages on their social media page, touting itself as an “Island Sports Bar” announcing anything from building progress to holiday fun. While the Water Oak Grill, a new notion from experienced restaurateurs behind local favorites such as the Olde Bay Cafe & Dunedin Fish Market, appears to be quieter about their future menu of seafood and steaks. They will be located on the southeast corner, closest to 2nd Avenue North. 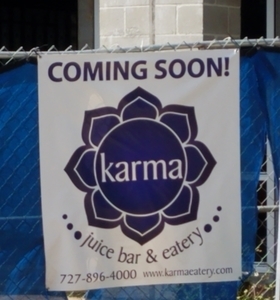 The third, and most recently announced establishment is karma juice bar and eatery. They will be located on the second floor, but separate from the Bay to Bay offices and still conveniently accessible through a stairwell, an elevator and Main Street entrances. This will be the third location for karma, as they already have two others in downtown Clearwater and in St. Petersburg. Based on their current locations’ offerings, their fare seems fresh, light and full of health-conscious options. Behind the commercial property will stand the 24 well-appointed apartments, each one leased and managed by local Realtor, Donna Nettestad from the Remax/Realtec group. Most of the floor plans have two beds and two baths, with a sprinkle of one bed, one bath options, as well. All of the apartments will have the fine modern finishings one would expect when living in a downtown setting; such as stainless steel appliances, chrome plumbing fixtures, granite countertops and solid wood cabinets in white. They are currently advertised in the Coming Soon section on Zillow.com and boast they will allow the occupant a lifestyle where one can just “close the door and go without having to worry about the upkeep and maintenance”. Nettestad and her associates are currently setting appointments with prospective residents to discuss further details and believe tenants should expect an early August move in date. “Right now there is a good vibrancy associated with downtown in general, and this is only going to add to it,” Faw states. “We’re looking forward to letting the dust settle and seeing the finished product.” Sounds like a great plan, Mr. Faw, thank you for keeping us posted! This Bay to Bay project on the second block of Main Street, with an attractive commercial building on Main Street and nice looking luxury apartments behind it, is exactly what our downtown has needed for a long time. Having had an ugly vacant dirt lot across the street from the Chamber of Commerce for a decade has been a great embarrassment for Safety Harbor. Finally, we are seeing nicely designed buildings with great architectural features filling in this important space on Main Street. These designs will fit in well with the historic look of Safety Harbor. It will be an important boost to Safety Harbor to have Bay to Bay bring its business headquarters to Main Street. This will raise the profile of our Main Street and bring many people downtown to support our local businesses. The luxury apartments will also allow more people to live downtown and help ensure a lively and vibrant downtown that can make all of our downtown businesses a success. Safety Harbor is looking better every day and this Bay to Bay project will bring back the vibrancy to this part of Main Street that has been missing for more than a decade. Are the apartments going to be pet friendly? If I had known that craziness that goes on at the local level when I first got here, I would have been WAY more active during that election and would’ve voted too. Thank you Aditya, And Nancy Besore still congratulates herself for keeping the Ferminich site a derelict piece of property. It has been abandoned for years and looks terrible. It’s taken 10 years, yes 10 years to get a new building on Main Street. It will probably take another ten years to get the Ferminich property developed with Nancy Besore as Commissioner. She and her fan base try to stop anything from moving forward. Ugh! 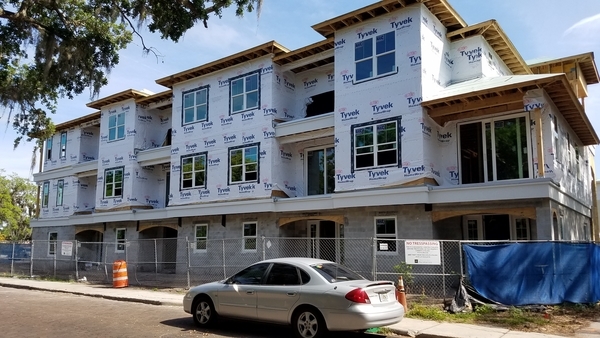 Not only is this the first new building on Main Street in 10 years , as a bonus it is spectacularly well designed and constructed by a builder who grew up in our community and continues to make Safety Harbor home. Other than the new condo building, what “new massive buildings” are you talking about? Also, where is this “concrete jungle” that you are talking about? Safety Harbor has gone more than a decade with only two new projects being built downtown – the new condo building and Bay to Bay’s new project. When I moved to here many years ago, Safety Harbor had many not very charming, dilapidated buildings throughout the downtown area. The city now is more beautiful and charming than it has ever been. Realtors keep coming to my door asking me if I want to sell my house. The last realtor told me that everybody she talks to now wants to live in either Safety Harbor or Dunedin. This is because both cities are getting a makeover and are creating an exciting and vibrant downtown area that people want to live in and want to visit. I agree where is parking going to be? Already hard to find a spot let alone get your car sideswiped if parked on a side street. That dirt lot could have been a much nicer parking area if Mayor would have done it. The great charm of our little town is going a way. I have lived in Safety Harbor for 15 years and I go downtown quite frequently. Never once was I unable to find parking within a few blocks of Main Street unless there was a Third Friday or another major downtown event. On a normal day, parking is not a problem unless you define a problem as not being able to park immediately in front of the place you want to visit. It appears that we are so used to visiting big box store with endless parking lots that we now expect to have such expansive parking wherever we go. Safety Harbor has an old historic downtown and some walking will probably be required. Everyone also needs to consider not bringing your car downtown every time you visit. You can also use your bike or you can Uber to get there. What a low effort, spammy post. I wouldn’t put my name on that either. The post shows you operate on a very low level of complexity. I’ve lived here 5 years. Love it here. Things are way better off now then they were then. If I want to go from my house to the “concrete jungle” I walk 15 minutes there and 15 minutes back. In my first home in Safety Harbor I rode my bike 15 minutes there and back. That was my solution to parking issues then and now. I guess I’d have a downtown that is lively and attracts people then to be able to choose which of 100 open spots I’d like to park my car in. There was a time when putting sidewalks on the water front park and “ruining” the passive green space was seen as a bridge too far. Now the space is actually used. I’m with Matt in that a vibrant, attractive downtown is the goal. Building more parking is counter to that goal. There is only so much land area in downtown and improved land values (i.e., buildings) there pay for many of the things the community needs and desires. Why would a community want to convert buildings or green space to pavement for car parking knowing that it would yield little or no taxable value to city coffers and be a negative for the environment. We are fortunate to live in a city where walking and biking to downtown is largely possible and enjoyable. For those who drive, parking is readily available most hours of the day and days of the year. Well-organized events will offer shuttles or other solutions to their patrons. Uber or Lyft is another low-cost way for individuals to access downtown without shifting the considerable land/construction costs of car parking to housing costs and building rents, which affects how much we pay for housing, goods, and services. Sure, structured parking is a more efficient use of land but extremely expensive without critical mass and a pricing structure that encompasses street parking and public lots. One could say there is a high cost to free, abundant parking, especially in a tiny downtown. so all this building where the hell are people to park??????? On one of the many empty parking spaces on Main St, 1st Ave, public parking by the Spa, at the library etc. etc.